In the West Keystone neighborhood, Soda Springs is on Wild Irishman Road and lies just a short free shuttle ride from the Keystone Resort, one of the most visited ski resorts in North America. Free parking goes along with these condo or townhome style homes and easy access to futher recreation opportunities beyond skiing. These homes are conveniently near the Snake River, the countywide bike path, hiking trails and surround the Soda Springs pool and clubhouse. 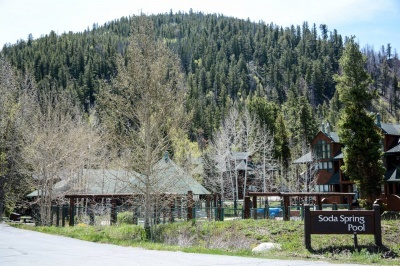 A few less than 50 homes are part of the Soda Springs townhome condos surround the community space that includes an outdoor heated pool, hot tubs and on site ski storage. Two types of units, and studio and one to three bedroom homes are part of Soda Springs, and range in size from more than 650 sq. ft. to less than 1,800 sq. ft.